The Hope centre provides a whole raft of support and services to the homeless. They are being booted out of thd building to make room for more beds, but there will be no more of the other services at that centre. IMHO it's a political move by the Council. 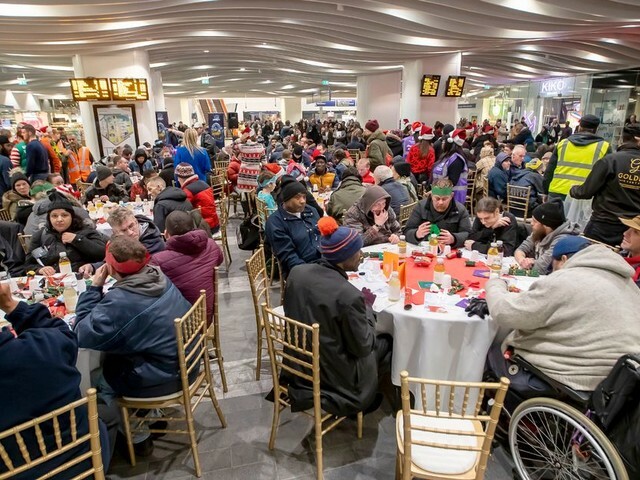 New Street Station , Birmingham ... feeding the homeless ? Afterwards , did they all get one way tickets to anywhere else expect here ... by chance ??? Chris, I know and I find this wrongful situation to be physically painful. I spent some time being homeless with no income or access to the NHS although I was not on the streets. Being on the street is very different. I learned a lot very quickly when the people who help are usually the ones with very little. From working at the top of the building design professions I fell a very long way and there are no safety nets. Those insurance policies that don't pay out. The non existent support network who just sign post you round in ever decreasing circles. As a victim of crime and bust to hell there was nothing. But I survived after the bike smash because I refused to give up. I was still lucky though, I hold no illusions. While I'm around , the 14 million or so on " The Street " will have a voice ... a very loud one at times ! The government won't get away with it forever or for much longer. The tide has turned. What they are doing isn't the British way, its not what Brits do. They don't represent us our our feelings. I love the Prisoner tv series. So very 60s in style and yet relevant today. I hated the Prisoner. It never damn well seemed to end. How DID it end in the end? Without sounding I hope TOO much like a typical Tory-voting middle aged middle class voter, isn't one of the 'problems' about homelessness is not just that folk are homeless....it is that those who are homeless all too often have severe 'other problems' from mental illness to addiction etc etc etc. 'Just' providing them with a roof over their heads is not enough to turn their lives around ....a HUGE investment in remedying the 'harms' done to them that caused those 'other problems' is what is needed. Homelessness is often only a 'symptom' not the problem itself???? Being homeless is ... being homeless ... whatever the problem. It's for society itself to deal with the problem ... the root cause currently ignored ... for some. Many now joining the ranks do not suffer from any underlying " Ailment " ... a case of more dropping through that mythical safety net as Austerity continues to rule in many econmic and social wastelands. As for " The Prisoner " ... more of asking the questions type drama ... not intended for mass media viewing. ... and some of those questions , as Colin pointed out , as valid today as they were then. How should society be governed ... for one. Well . somebody certainly expressed a " Happy New Year " to one homeless person ?
" All of his worldly goods were in the van and he has been left without clothes or bedding. " A homeless man has been left with nothing but the clothes on his back after his van went up in flames in an attack suspected to be deliberate. Video circulated on social media showed the parked vehicle engulfed by fire in Collingwood Road, Whitstable, Kent, at about 7pm on Thursday night. Police confirmed they were still investigating the cause of the fire on Friday, and did not rule out arson when contacted by The Independent. Lynne Forester, who manages the nearby Revival Ice Cream Parlour and Veggie Bar, set up a JustGiving page for the man, named locally as ‘Pete’. The online fundraiser smashed its initial target of £200 within hours and has so far raised almost £1,300. Thankfully , article not from the Daily Chuckle ... one could hear the cheering from their comments section ?